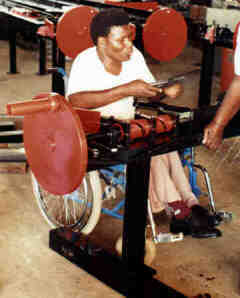 New Dawn Engineering's Diamond Mesh® Makers are manually operated and employ one, two or three people. They feature sturdy steel construction, heavy flywheel, all-ball bearing construction, hardened blade and fully hardened giraffe (the main fence forming parts). 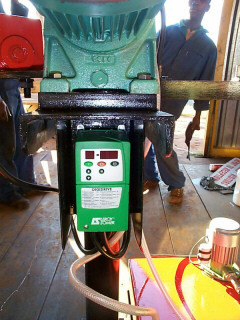 These are the highest quality manual machines on the market. They make standard diamond mesh fence (chain link - 76 mm hole) using wire from 1.6 mm to 4.0 mm in heights up to 2.5 metres. 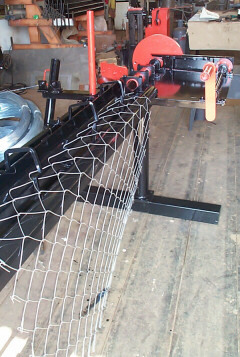 Workers can produce 30 metres of high-quality fence in approximately 3 hours using the bottom-of-the-line machine. 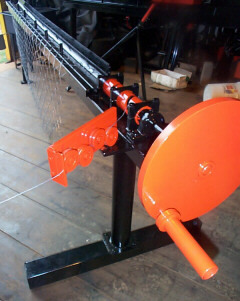 Owners frequently report making fencing for over 5 years without having to buy any spare parts. The blade and giraffe do require oiling (old engine oil is OK) every few minutes. Consumption is about 1 litre per day. Excess oil is channelled back so over-oiling is not a problem. 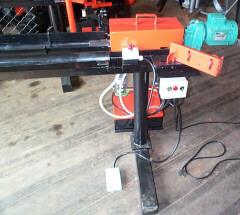 100mm machines are available for making 100 x 4.0 reinforcing mesh for the mines. 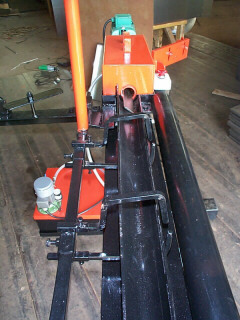 Wire tensioner with hardened rollers and ball bearings keeps the wire feeding properly into the Giraffe. See figure 1. The main operating mechanism of a Diamond Mesh or Diamond Stucco Mesh Maker is the Giraffe. New Dawn Engineering makes numerous aperture sizes from 10mm to 76mm. See figure 2. This is the latest electronically controlled Diamond Mesh Maker. It has variable speed, variable acceleration rate and auto-braking. 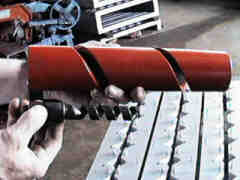 Owners report that experienced operators can produce 9 rolls per day of 1.8mx76mmx2mm fence. 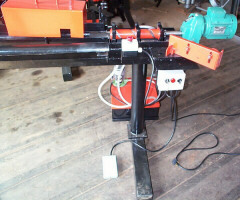 The simplest electric version is the Model 2E which does not have the semi-automatic advance mechanism nor the roll winder. It requires a soluble oil, like Shell Dromus B mixed 1:10 with water as a coolant/lubricant. Note the coolant tank and recirculation pump in figure 3. The electric models do not require hand-oiling like the manual machines (Model 2 and Model 3SA). All the Diamond Mesh Makers take the standard giraffes and blades. 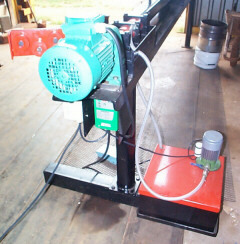 The Model 2E is a basic, high speed Diamond Mesh Maker. Click pictures to make larger.